Below is a list of unigenes available for Malus x domestica. Click the unigene name for further details. Below is a list of transcript assemblies that are available for Malus x domestica. Click the assembly name for further details. The domesticated apple (Malus x domestica) is the most economically important species in the Malus genus. Apples are one of the 20 most productive crops in the world when measured by tonnage, and the domesticated species is grown in temperate regions of the northern and southern hemispheres. The domesticated apple originated approximately 4000 years ago in central Asia, near the Tian Shan mountain range, where the borders of western China, Kazakhstan, and Kyrgyzstan meet. The main progenitor species is Malus sieversii, but there were additional genomic contributions from Malus orientalis and Malus sylvestris as the domesticated species spread westward. Domesticated apple is a self-incompatible tree, and apple cultivars are propagated by grafting scions onto dedicated rootstocks. Written records indicate that some apple cultivars were documented as early as the 1200s, and new cultivars are still developed through modern breeding techniques. Most domesticated apple cultivars are diploid (n=17), although triploid and tetraploid cultivars are also documented. The estimated genome size for domesticated apple is roughly 750 Mb, based on the genome sequence for the ‘Golden Delicious’ cultivar. Apple fruit is a good source of fiber and energy, and can be consumed in a variety of ways. Much of the crop is eaten fresh, and fresh fruit can be stored for up to a year in the right conditions. Apples can also be processed into sauce, fruit leather, cooked into other foods (such as pastries), or dried in slices. Apple juice can be consumed fresh, fermented into alcoholic beverages, or made into vinegar. China produces more apples than any country in the world, while Poland is the world’s leading apple exporter. 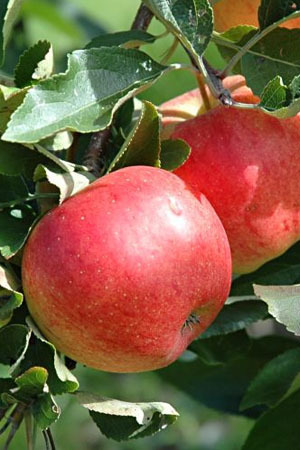 The major challenges for apple breeding include increased disease resistance, especially for apple scab and fire blight, and increased marketability in terms of improved taste, texture, storage, and resistance to browning.